« Whose Fault Is It Anyway? I am greatly interested in the discussion stirred up earlier this week in my posts on the Atonement. The discussions were good, and well behaved. Indeed, I would say that the conversation was productive. What fascinates me, is the interest we have in the discussion of the Atonement. The popularity of any particular blog post is still a bit of a mystery to me. I run about 700 views a day on a normal day, and up to 1200 or 1300 or a really good day (this often gets us listed in the “Top Blogs” at WordPress – though they don’t send you an award or anything). Tuesday-Wednesday’s posts on the Atonement had about 1200 viewers and landed us on the Top Blog list (at about 57th). Having said all that (I’m sure you’re interested in the dashboard of this blog), I remained puzzled at the popularity of the topic. I suspect that the issue carries as much interest as it does because it’s as much at the heart of our faith as anything. But here I draw our attention elsewhere (if I might) and say, even the Atonement, interesting as it is, is still about God – indeed it is all about God. I frequently suspect people of being interested in theological topics but not about God. God is harder. The real issue with the atonement is not the preference of one theory over another, it is what it tells us of God and how it reveals God to us. It is why any theory of the atonement that loses sight of God as He is revealed to us in Christ is problematic. God reveals Himself as good and the lover of mankind. In becoming man He empties Himself, and shows Himself willing to do everything imaginable to win us away from death and to restore us to relationship with Him. Any theory of the Atonement that loses sight of that fact is, in the last analysis, talking about some other God. I read in an (Orthodox) critique of some other (Orthodox) writers on the doctrine, that they were guilty of Marcionism because they argued that the Orthodox version of the Atonement presented a “nicer” God than the Anselmian version. I pondered what would be superior about a theory of the Atonement if it presented God as meaner than some other theory. There is, I believe, a general interest in Atonement theory, both on the popular and the scholarly level, precisely because it goes to heart of the question of what kind of God we worship. It reveals the character of God to us in a way few other things do. I have attended Churches (not Orthodox) who cheered when a preacher spoke of all those who were going to hell. I’m also well aware of Orthodox who do much the same on the Sunday of Orthodoxy if they happen to attend a service where the Anathemas are pronounced. If you are the friend of God then you have no joy in anyone going to hell, or in anyone being anathematized. Hell there is, and anathemas as well, but a Christian who loves God should be friend to neither hell nor anathema. In the end, it is all about God. He has acted in such a way as to reconcile us to Himself. He, we are told, is not willing that any should perish, and we should find no joy in it either. My own thoughts are very much shaped by the fact that I think of hell as something that has already started for us (moreso for some) as has paradise (moreso for others). My experience with working with the tormented souls of hell (what else is pastoring about?) has never made me wish it on anyone or to take any joy in the existential pain of another creature. Atonement is about God – may He rescue us all and deliver us from destruction! This entry was posted on December 14, 2006 at 7:00 am and is filed under Orthodoxy. You can follow any responses to this entry through the RSS 2.0 feed. You can leave a response, or trackback from your own site. 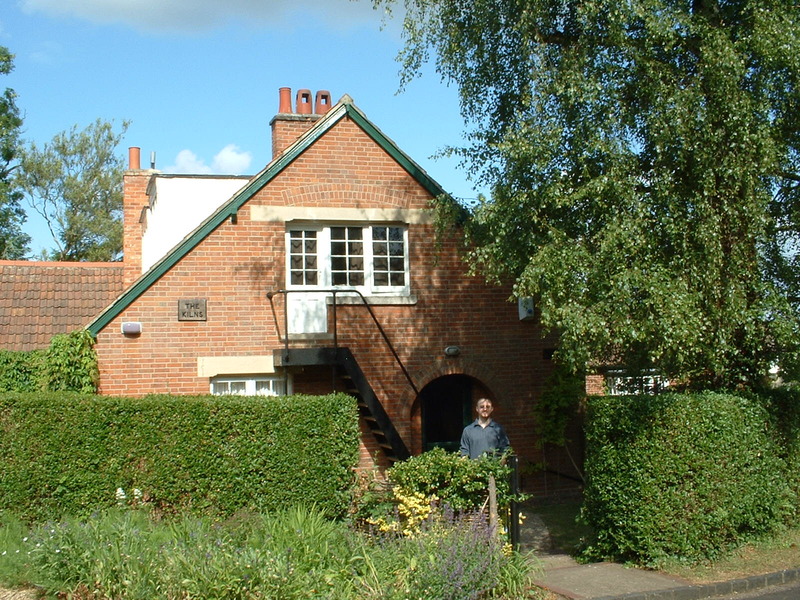 The Picture is of C.S.Lewis’ famous home, the Kilns, that I visited this summer. The strapping young lad in the photo is my fine son, James. As a new convert to Orthodoxy I found your articles on salvation and the atonement to practically sparkle with clarity. It has been difficult for me to chuck years of protestant understandings and to be able to think like an Orthodox Christian. These articles (actually just about all the articles in your blog) help and I thank you very much for them. I frequently suspect people of being interested in theological topics but not about God. God is harder. Isn’t that the truth! I have found in me a tendency to spend more time talking “about” the things of God in theological discussion than talking “to” God in prayer. Lot’s of reasons why this is so but none of the good ones. God is harder, indeed. Such comments encourage me to do what I’m doing. It’s a labor of love – I like to write. But if the labor seems to meet a need – then it is worth doing. Thus far, I am greatly encouraged. May God help us all to pray more. I don’t think the criticism was that the polemical Orthodox version of God was ‘too nice,’ but rather that it was not true to the profile of God in the ‘scriptures’ [OT] which was why Marcion’s name was raised. Proceeding to the merits of that claim, the exact profile of God in the OT depends on where one is sitting, as you have observed. If Christ is the apostolic key to the correct interpretation of the OT as Christians believe, and if Christ “gave himself up for the life of the world,” then the Orthodox profile of God as “the lover of mankind” who “wills that all be saved” looks pretty sound. I agree with your reading, Jack. The anti-Anselmian Orthodox position of Romanides, Fr. Anthony Hughes, et. al., though not correct enough historically, are accurate when it comes to attacking a very active straw man who has infected popular teaching (I suspect in both East and West). The critique (Orthodox) that was done was correct in citing historical problems as well as citing Cabasilas as an Eastern Patristic source similar to Anselm in content. No great surprise there. But the critique went on to vilify Romanides, et al, as “Marcionite” because they were certainly reinterpreting the OT God to be defined by Christ (which makes him distinctly kinder, etc.). However, As an Orthodox priest, if someone is asking me to defend the actions of the OT God, which even Christ was reluctant to do, then I will have difficulties. I indeed believe that we must reread the OT through Christ (the Fathers certainly did). Christ is the definitive revelation of God and the key to reading the OT. He is a good God who loves mankind. This, as you seem to agree, is not Marcionism. I believe in the God of the OT, I just believe that he must be read through Christ. That, I think, is the Orthodox Christian witness. After all, we sing, “blessed is he who smashes your little ones heads against a stone,” every week in Matins without flinching, because we radically reinterpret that verse. Anyone who does not reinterpret that verse needs to go to confession and deal with rejoicing over murder. The deprecatory passages are regularly reinterpreted by the Fathers. This is not Marcionism, it’s Biblical interpretation. Thanks for the good note. I’m not familiar with the reference you made when you said “…even Christ was reluctant to [defend the actions of the OT God]…” I must be ignorant of that to which you refer; could you enlighten me? Thank you, Father. Would it be inappropriate here to ask how Orthodoxy does interpret the Psalm you quote: “blessed is he who smashes your little ones heads against a stone”? Or perhaps that’s for a different post/topic; I’ll let you decide. First, I second Lucas’s request for clarification. That struck me as unfamiliar territory as well. I heartily agree, even admitting to this some myself. I once heard an interview with Barbara Brown Taylor on NPR, and she was asked about beliefs. As a response, she spoke much of ecumenical theology, but not much about the True God. In fact, I would say, not at all about the True God. Not that I expected anything less, but, all the same, it troubled me. And, what you say here, I think, hits the nail on the head as to why she and so many other people (again, myself included on occasion) tend toward theology as opposed to God. I would imagine that this is because talking about theology requires just that: talk. Yet, an encounter with God requires something deeper and more abrasive to the mind of modern society than just endless babbling about religious theory. As you have already written about, an encounter with the Living God requires nothing less of a person than a change. Not just a change in his behavior, but a change in his mind, his heart, his motivations, a change in his very being. Pray for me that I may be less of a theologian and more of a Christian. Good question – perhaps worth an article at some point. The reference is to Christ’s rebuke of the disciples who sought to call down fire from heaven to consume a village Luke 9:52-56. You could take an approach that cites the verse in the passage, “For the Son of Man came not to destroy men’s lives but to save them,” treat it dispensationally or something and say, well, that was Christ’s ministry. But I believe strongly that the Christ of the New Testament is indeed that God of the Old Testament. In icons He is identified as “He Who Is” that is, the tetragrammaton, Yahweh. Properly, Orthodox theology does not look at the OT as a revelation of the Father, and the NT as a revelation of the Son. No man has ever seen the Father, He is made known to us only in His Son. “No one comes to the Father except by me.” Thus the God whom we encounter in the Old Testament is still the 2nd person of the Trinity, the Logos, though not incarnate. There are pre-incarnate encounters with Him, some of which prefigure the Trinity, but no one has visions of the Father. This is not possible. Thus (to take up Jason’s question) when the Fathers read “blessed is he who smashes your little ones heads against a stone” (which we hear in Matins all the time), they interpret as refering to the little thoughts that tempt us early in the day. They are to be smashed against the stone of Christ, lest they grow and become temptations we cannot endure. But it would be wicked in the extreme to say that smashing babies was ever ok. Dispensationalism is not an Orthodox teaching. Murder, killing is always wrong. What if God commanded it we can be asked. I still say it is wrong. There’s much more to be said on this topic, more that I need to learn and I will write more in time. But for the moment I am comfortable starting with Christ, who warns me not to be of a wrong spirit in these matters, and that I can always be sure that the Son of Man came not to destroy men’s lives but to save them – and if he came in the incarnation to do this, His purpose was never any different. For the Lamb was slain before the foundations of the earth. The purposes of God, hidden throughout the ages, were made known to us in Jesus Christ. Made known, not changed. There’s a difference. I hope this helps. But it’s an important conversation for Christians to be having. As an Evangelical Christian who visits this site every day I must say I am blessed by the theological articles by the father (as well as the comments) and the Orthodox understanding of things on the Cross and the Atonment. I appreciate the great emphasis on God in the atonement and of God’s Grace to us. Thank you for your encouraging words. I truly want this to be a place where we are all blessed. There are many non-blessing sites on the internet and yet we’re all here a lot. May God make it possible for this to continue as a place of blessing. Orthodoxy really isn’t an argument with a denomination, when we stop and think about it, but is the common inheritance of all Christians. It was there when there was nothing else (though my Roman Catholic friends would say that a little differently – I mean no disrespect – only that the Rome of the undivided Church is more like Orthodoxy today than it is like Rome today). But this is your heritage as well. Wisdom of the saints that we should all hear. May God bless you. This post and the comments touche on a number of issues, especially for inquirers who are investigating Orthodoxy and are concerned about “taking the Bible seriously,” if not literally. In my own struggles, I’ve tried to follow the example of the Fathers and read the violent conflicts of the Old Testament as a call to spiritual warfare within my own soul. Given some of our family issues – especially relating to our daughter with autism and the lousy way the world treats her – I’m especially prone to anger and resentment. Oops… I was typing while other responses were being posted. Perhaps, if appropriate, you could offer some Orthodox reading recommendations concerning this subject (i.e. atonement)? These are easy introductions with very good points. Several of Fr. Patrick’s pages seem to be unreachable on the net at present. Ah, so the encounter Moses had on Mt. Sinai (seeing the ‘back’ of God and such) was an encounter with the Son? Interesting! I believe the link for the article from Reardon on Redemption is found here at http://www.orthodoxytoday.org/articles6/ReardonRedemption.php. The one on Expatiation at http://www.orthodoxytoday.org/articles6/ReardonExpatiation.php. I once was at a Baptist (I grew up Baptist, though my father, who was also then my pastor, was not of the hellfire-giddy sort) revival in which the preacher lusted after God’s punishment of the wicked in hell and the congregation got very excited. In my childhood I thought I was probably going to hell. I was in 5th or 6th grade and I would pray to “get saved” each night when I took a bath. I knew that the prayer had to be sincere for my salvation to be real, so I would try to pray it as earnestly and sincerely as I could. But then I would go and cuss the next day or disrespect my mom, and the doubts about the sincerity of the last night’s prayer would sink in, thus repeating the cycle. I was terrified that God was going to damn me because I could not get sincere enough. As I got a little older I numbed that existential terror with any number of things which caused me to go from a mere doubting of my salvation to an “assurance of damnation,” the antithesis of Baptist psychology. In later years I would come to think that I had previously wanted to be damned, and I had wanted there to be a God who took pleasure in damning me for simply not being able to get everything just right. Because if that were true then the story of the universe is all about the great injustice God has done to me, and let’s face it, sinners like me want to hate God. Even when we think that we want to be saved but at the same time take pleasure in the idea of God’s wrath towards others there is that inescapable sense in which those “others” that get God’s wrath are simply mimetic icons of our own sin. We want God to hurt sin and sinners. Instead He does something far more harsh. He heaps hot coals upon our heads through His love and kindness and silence. Instead of giving us what we think we want by pouring out His wrath on us He allows us to pour out our wrath on Him. But of course in Christ, He is us, so to speak, and in Him we are given the unique opportunity to hate God and ourselves in one Person. Being finite beings, however, it is possible for us sinners to spend all of our hatred. And then what? The long, hard turning around. Now, two and a half decades from my bathtub salvation anxiety, I have come to fear God’s mercy more than His wrath. It hurts more, because it is not what my sinful will wants. I understand, admire, even lust after raw force and brute power. But kenosis? The Son of God with a crown of thorns and a reed as a scepter? I’m afraid that I, like the crowds, am more inclined to want a violent thief as the icon of “the son of the Father” (Bar-Abbas). But then my 23 month old daughter catches my eye and I think, “no, it must be reeds and thorns.” How can God take pleasure in someone’s son or daughter being damned? Unrepentant sinners are not sinners in relational abstraction, they are somebody’s kin. Thank you Fr. Stephen for these posts and for your comments. Thank you for such sharing from the heart. I think we’re all living somewhere in a Flannery O’Connor novel. A child in a bathtub praying for salvation, then being sure of damnation. You’re so right when you look at your child and know the love of God. I think of Ivan Karamazov’s “refusing the ticket” in the name of the poor dear little girl and his tale of childhood suffering. It’s poignant. What none of us must do is lose touch with the poignancy of such things when we do theology, to ever do it dry and calculated. It’s not sentimentality that is of value to me, but it is my heart revealed to me, broken and contrite. My wife and my children do that to me. They (by God’s grace) make me a theologian. Theology of the mind is not real theology, that is the biggest mistake of the Scholastics in my opinion. Real theology comes from sharing one’s communion with God. The deeper we allow the interpentration of God into our beings, the more apt we are to approach real theology. I believe that of all the great saints and teachers in the Church only three have ever received the title of theologian. That does not mean that we should cease striving to penetrate God’s mystery in our lives simply because we are dark glasses, quite the contrary. It merely means that we have the humility to realize what it is we are actually doing. Well said, Michael. I think it is only in a contrite heart that such communion becomes possible, or accessible to us. Real theology is quite rare. “A contrite and humble heart God will not despise” Is it possible to be prideful in our contrition or does the pride, if it exists, make our confession of no effect? Confession, I think, is good – sometimes better. Pride and contrition – true contrition are probably not compatible. Pride in one’s contrition is probably just deception – the most common fault of all. I can’t fool God. Contrition is either real or false, and it’s the real stuff He looks for, and that he hardly ever gets from me.